Cut chicken breast into bite-sized pieces and finely chop bacon. Slice pepper into thin strips and halve cherry tomatoes. Peel onion and garlic and finely chop. Heat olive oil in a large pot and sauté chicken for approx. 5 min. over medium heat. Add bacon, onion, and pepper and season with salt and pepper to taste. Cook for approx. 3 min. Add garlic, oregano, sugar and cherry tomatoes. Cook until any liquid has evaporated, approx. 3 min. Deglaze pot with white wine, chicken broth, and tomato purée, making sure to scrape the bottom of the pan for any brown bits. 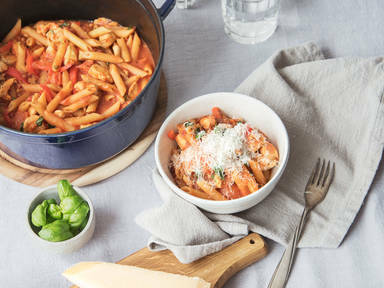 Bring to a boil, then add the penne. Cook over medium heat until noodles are al dente, approx. 10 min. Grate Parmesan over, sprinkle with basil, and season with salt and pepper to taste. Enjoy!